This attitude stems from product teams seeking validation. In their desire to hear ‘good news’ about their idea they’ll go after easy-to-recruit ‘advocates’ (usually by mining their social media followers). Everyone loves good news – so – what are they missing out on? Go talk to that woman who used to ride, but now has a raft of real life experiences resulting in reasons she’ll never ride a bike in the city again, let alone a shared one! This woman would be classed as a ‘rejector’ and would be ‘screened out’ of most recruit briefs I’ve seen, but I’ll often try to include people like her. Including these ‘hard to reach’ people in your user research provides vital contrast and perspective. Their different attitudes, behaviours and values provide new lenses through which to view your product, challenging it’s place in the market. 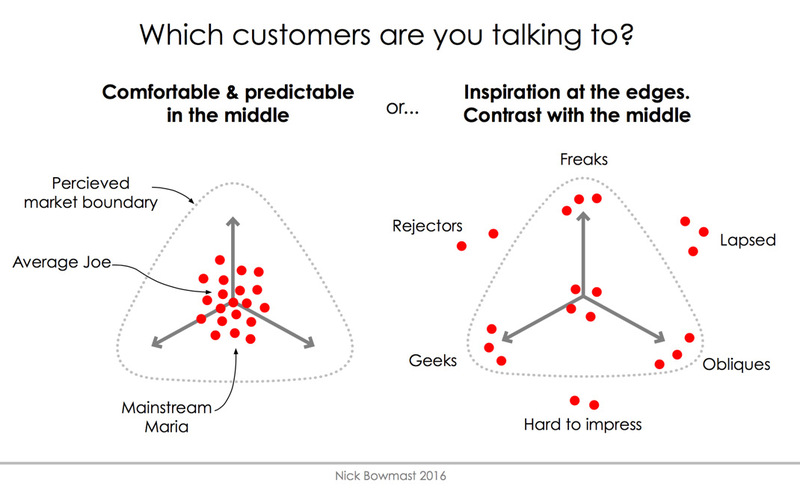 These alternative viewpoints help define who your core customers are, what matters to them and how your product meets their need. And it’s not just bikes that have pulling power – Great products and services convert people to the value they offer, so make sure you’re testing the ‘pull’ of your proposition by including the people who might be the hardest to convert. I often find myself drawing a version of the diagram above for clients. It basically says ‘recruit from the edges’. When planning a recruit during design research, clients sometimes refer to a bell or adoption curve, but I find it’s difficult to imagine where these ‘hard-to-reach-but-worth-the-effort’ types live on the curve. Perhaps my version is a kind of bird’s eye view of the bell curve. If you’re running a 1000 person survey it makes total sense for the shape of your sample to be representative of your market, but when you’re running a qualitative study with perhaps only a dozen or two participants, you want to be sure they are representative of the challenges your customers present, rather than being an accurate slice through the bell curve. And to make sure you’re testing your product’s pulling power, I’d suggest you go for some people just outside the edges and even fleeing. 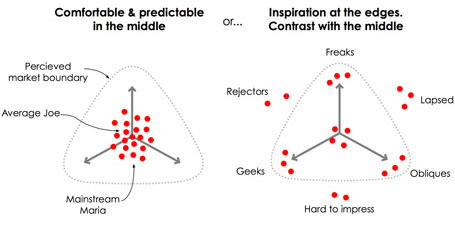 Their attitudes to your product will help you turn up the contrast, and maybe even push you in new directions. Again another great article Nick. When I was recruiting for research on Tesco.com I was urged to find average customers “because this website is for everyone”. However, the average customer doesn’t have diabetes, but 3.8 million Brits do. So instead we found people who were fired up about having diabetes and tried to understand their world, the same went for super healthy, people with food intolerances, parents who were concerned about additives, people are only organic, etc. The insights we gathered helped us create entirely new strategies for the website, that had escaped the analysts with their terabytes of quantitative research. Keep up the good work in the shire.